Posted on Thu, Feb 9, 2012 : 11:55 a.m. 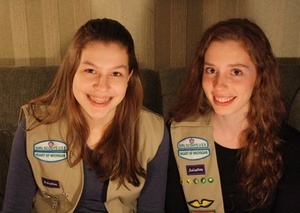 The United Nations has recognized the efforts of two Ann Arbor-area Girl Scouts campaigning to get rain forest-destroying palm oil out of Girl Scout cookies. Madison Vorva and Rhiannon Tomtishen, who are students at Greenhills School in Ann Arbor, received the first Forest Heroes Award for North America on Thursday. The Union of Concerned Scientists nominated the girls for the award for their effort to bring attention to the threat to orangutans and tropical forests posed by palm oil production in Indonesia and Malaysia. Palm oil is used in thousands of products, including Girl Scout cookies. Vorva and Tomtishen learned of the connection between palm oil and orangutan extinction five years ago when they began working on earning a Girl Scout Bronze Award, which requires scouts to raise public awareness about an issue. Inspired by anthropologist Jane Goodall’s work with chimpanzees, the girls focused on orangutan protection. They discovered that forests in Indonesia and Malaysia, the ape’s primary habitat, were being cleared at alarming rates to plant palm oil plantations — and that palm oil is commonly used in baked goods, including all 16 varieties of Girl Scout cookies. Last year, Girl Scouts of the USA and Kellogg’s, which produces Girl Scout cookies, developed a plan to transition to “sustainable” palm oil by 2015. Kellogg’s also pledged to reduce palm oil use across its entire product line. The girls and UCS see this as a good first step, but they say the organization that certifies sustainable palm oil does not have adequate safeguards in place to ensure that the palm oil is not contributing to tropical deforestation. Numerous media outlets from around the country have covered the girls' efforts, including CBS, MSNBC and Time magazine. They have launched a new online petition at Change.org asking the Girl Scouts to ensure that palm oil used in the organization’s cookies is not being grown by a company that is clearing rainforest to produce palm oil. It already has more than 57,000 online signatures. An earlier petition the girls started got more than 70,000 signatures. See a video about the girls’ efforts below or visit their website. So does this mean we should boycott the cookie? I know I will. Palm Oil isn't good for you any how. Good luck to the girls. Politics will play a factor into this...sadly. Fri, Feb 10, 2012 : 1:06 p.m.
How long ago were we told &quot;and a little child shall lead them&quot;? This is a great example of what can be done by the determined effort and leadership of two young women with a purpose. There are issues out there just waiting for the next &quot;child&quot;, in case the adults can't handle it. Thu, Feb 9, 2012 : 7:05 p.m.
Thu, Feb 9, 2012 : 5:41 p.m. This is definitely a step in the right direction. Now for a look at some of the other ingredients in that long long list on the package of Girl Scout Cookies. It is this list that keeps me from buying them. I could be convinced to change my mind.